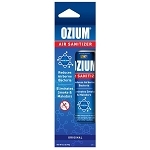 Ozium Air Sanitizer 3.5 oz. Ozium Air Freshener fights airborne germs and eliminate ordors caused by smoke to keep the air you and your family breathe fresh and clean . Originally developed to combat airborne bacteria and germs in hospitals, Ozium is clinically proven to ELIMINATE offensive odors, not just mask them. It’s effective in eliminating smoke odors. Because it kills the bacteria that causes the odor, it eliminates the smell completely. The deliciously fragrant Air Freshener Sprays are great for use in your Home, Kitchen, Restroom, Office, Car, or RV! Spray into the air or any circulating vent in your home or office and you will notice an immediate improvement.